Harriet is a typeface published by Okay Type. This family font contains 20 fonts inspired from traditional faces (Baskerville) and modern faces (Century). 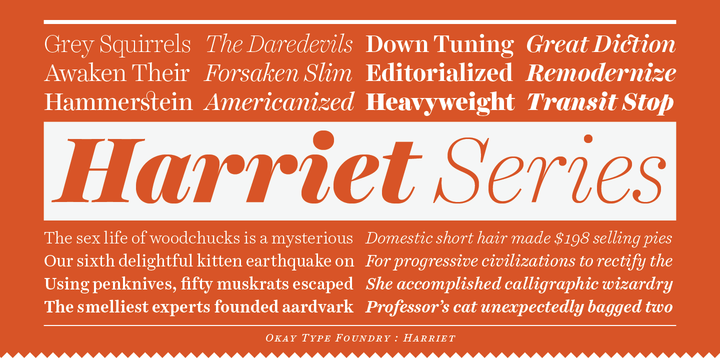 As well, in 2012, The Harriet Series was awarded a Certificate of Type Design Awesomeness from the Type Director’s Club. A Typefaces you cannot miss! A font description published on Monday, November 12th, 2012 in Fonts, Okay Type by Alexandra that has 6,764 views.